Alors que l’Italie est toujours dans l’incertitude, nous vous proposons un retour sur les récents événements qui s’y sont déroulés. En mars dernier avait lieu les élections régionales en Italie. A l’issue du scrutin, aucune majorité ne s’est dévoilée. Cependant, les deux partis arrivés en tête, le mouvement antisystème 5 étoiles (32,7 %) et le parti d’extrême droite La Ligue (37 %), respectivement menés par Luigi Di Maio et Matteo Salvini, se sont alliés pour proposer un gouvernement et un programme au Président italien, Serge Matarella. Ainsi, les deux partis ont donné lundi 22 mai, le résultat de trois longs mois de discussion. Le M5S et La Ligue ont donc décidé de choisir Giuseppe Conte au poste de Président du Conseil (ou Premier Ministre). Après avoir pris connaissance de cette proposition, le Président a validé le nom du Premier Ministre. Jusqu’ici inconnu du grand public, ce professeur et avocat devait alors composer son gouvernement dans les jours suivants. De nombreuses personnalités politiques étaient attendues. Notamment Matteo Salvini, pressentit au poste de ministre de l’Intérieur ou encore Luigi Di Maio au poste de ministre du Travail. 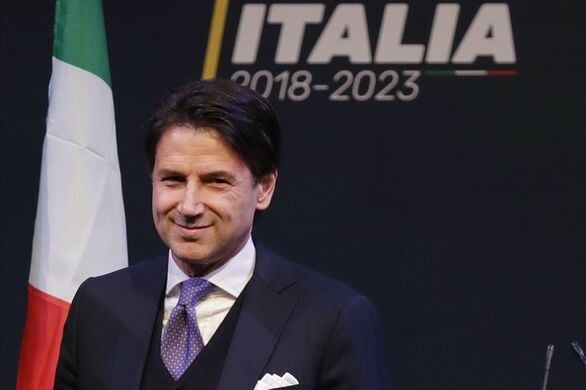 Giuseppe Conte avait également transmis dans un document toutes les mesures qu’il comptait prendre, telles que la baisse de l’impôt sur le revenu, une révision du système de calcul de retraite, l’instauration d’un revenu universel (fixé à 780€), une politique anti-migratoire, avec pour objectif d’expulser près de 500 000 migrants illégaux ou encore la remise en cause du la ligne de train Lyon-Turin. Par ailleurs, toutes les mesures annoncées ont inquiété l’Union Européenne, puisque le budget estimé était compris entre 100 et 170 milliards d’euros et était non financé pour l’instant. En effet, l’Italie est un des pays les plus endettés dans l’UE. De plus, l’Union Européenne a reçu de nombreuses critiques dans ce programme. Le 27 mai, Serge Matarella et Giuseppe Conte se sont entretenus afin de discuter des ministres proposés par ce dernier. A l’issue de cet entretien, M.Conte a annoncé sa démission, le Président ayant posé son droit de véto sur le choix du ministre des Finances. En effet, c’est l’eurosceptique Paolo Savona qui devait occuper le poste. A cette opposition Serge Matarella a expliqué son choix : “J’ai demandé la nomination d’un représentant de la majorité qui ne mettrait pas l’Italie dans une position difficile vis-à-vis de l’Union européenne”. Ce refus a vivement fait réagir Matteo Salvini et Luigi Di Maio. Suite à cela, le Président italien a décidé de nommé Carlo Cottarelli en tant que Président du Conseil afin de former un gouvernement provisoire, avant de futures élections qui devrait arriver avant la fin de l’année. I enjoy you because of your entire hard work on this blog. Debby loves setting aside time for research and it’s easy to understand why. Many of us know all concerning the compelling form you offer informative thoughts on the web site and therefore inspire response from some other people on the concern plus my princess is actually discovering a lot of things. Enjoy the rest of the new year. You are always doing a fabulous job. I truly wanted to jot down a brief word to be able to thank you for the lovely secrets you are placing on this website. My time-consuming internet look up has at the end of the day been rewarded with good information to share with my visitors. I would state that that we readers actually are very much endowed to live in a magnificent community with many wonderful people with beneficial opinions. I feel somewhat lucky to have used your entire site and look forward to plenty of more fabulous moments reading here. Thank you again for all the details. gmZ0L4 I was suggested this website by my cousin. I am not sure whether this post is written by him as no one else know such detailed about my difficulty. You are amazing! Thanks! Thank you so much for giving everyone remarkably memorable possiblity to read articles and blog posts from this site. It is usually very pleasant and full of a great time for me personally and my office co-workers to visit the blog on the least thrice in a week to learn the fresh tips you have got. And lastly, I am usually amazed concerning the astounding creative concepts you give. Certain 4 tips on this page are certainly the most beneficial I’ve ever had. I happen to be commenting to let you understand what a cool discovery my cousin’s girl encountered reading through your site. She even learned so many things, not to mention what it’s like to possess an incredible helping style to let folks with no trouble know a number of specialized topics. You actually exceeded our expectations. Thanks for delivering the priceless, trustworthy, educational and also unique thoughts on this topic to Gloria. My spouse and i have been now contented Peter could do his studies through the precious recommendations he got using your web site. It is now and again perplexing to simply find yourself freely giving procedures which usually people today have been making money from. And we figure out we have got the website owner to appreciate for that. The illustrations you made, the straightforward website navigation, the relationships your site assist to create – it’s got all impressive, and it’s really helping our son and us know that this topic is exciting, and that is rather mandatory. Many thanks for all! Thank you a lot for providing individuals with a very spectacular opportunity to read critical reviews from this web site. It really is very excellent and full of a lot of fun for me personally and my office co-workers to visit the blog on the least three times in a week to study the latest issues you have got. Of course, I’m just certainly motivated with the beautiful points you give. Some two areas in this article are honestly the best I’ve had. Thanks a lot for giving everyone an extraordinarily memorable possiblity to read from here. It’s always so ideal and also full of a great time for me and my office friends to search your site the equivalent of three times per week to learn the fresh secrets you have got. And of course, I am also at all times motivated concerning the fantastic ideas you give. Selected 4 points in this article are clearly the most beneficial I have had. My spouse and i ended up being absolutely delighted Louis managed to complete his basic research out of the ideas he made in your web site. It’s not at all simplistic just to be giving out guides most people could have been making money from. And we all already know we now have the blog owner to thank for this. All of the explanations you’ve made, the straightforward website menu, the friendships your site make it possible to instill – it’s got many incredible, and it’s really letting our son and our family know that this content is amusing, which is certainly very important. Thanks for the whole thing! I want to show my admiration for your kind-heartedness in support of persons who actually need guidance on this particular idea. Your personal commitment to getting the solution all around appears to be particularly useful and has constantly made women like me to achieve their pursuits. The warm and helpful report can mean a lot a person like me and substantially more to my colleagues. With thanks; from all of us. I wish to express thanks to this writer just for bailing me out of this type of situation. After looking out through the internet and seeing basics which are not helpful, I assumed my entire life was gone. Existing without the presence of strategies to the issues you have solved all through the site is a critical case, and those that could have in a negative way affected my career if I hadn’t noticed your web page. Your actual training and kindness in maneuvering every part was priceless. I am not sure what I would’ve done if I had not encountered such a subject like this. I can also at this time relish my future. Thank you so much for the professional and results-oriented guide. I won’t hesitate to recommend your web page to any individual who will need care on this issue. I wanted to compose you the very little observation to be able to thank you so much again for those spectacular information you’ve shared on this site. It was so unbelievably open-handed with you giving publicly just what many people might have marketed for an e book in making some profit on their own, chiefly given that you might have done it if you wanted. The good tips as well acted to become a great way to realize that many people have the same desire similar to mine to know the truth a whole lot more in terms of this issue. I’m sure there are many more pleasurable situations up front for people who read your blog. I must express my admiration for your kind-heartedness supporting individuals who should have help on this one question. Your personal dedication to getting the message all over ended up being especially practical and have continually encouraged employees just like me to arrive at their pursuits. Your useful instruction can mean a great deal a person like me and substantially more to my office workers. Many thanks; from all of us. I and also my pals came analyzing the good tips from your web page and so then developed a terrible suspicion I never thanked the site owner for them. Those guys were certainly happy to read them and already have sincerely been tapping into those things. Many thanks for indeed being considerably kind and for having this kind of helpful things millions of individuals are really eager to learn about. Our own honest apologies for not expressing gratitude to you earlier. Louvre windows allow you the greatest flow of air than any other window when fully open. The air flow is able to be varied by changing the pitch of the louvres, or in large openings by closing some blades and leaving others open. I simply want to tell you that I am just beginner to blogging and really loved you’re page. Very likely I’m likely to bookmark your blog post . You absolutely come with good stories. Cheers for sharing your webpage. great deal more attention. I’ll probably be returning to see more, thanks for the info! pPI8gF Looking forward to reading more. Great post.Really looking forward to read more. Great.